I love the Food Network and Ina Garten is one of my favorite Food Network personalities. She's written several cookbooks and I love them all. 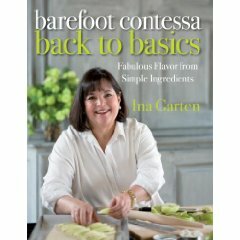 Her latest book is Back to Basics and it's well worth the purchase price and a great gift idea for Christmas. A great cookbook costs less than a decent restaurant meal, but can inspire you to cook foods that will bring you and your family great meals for years. That's what I call a good investment. I "discovered" Ina when I worked at Williams-Sonoma in college. The Food Network was just getting hugely popular and I was really getting into cooking with good tools and good ingredients. All of Ina's books were on display at the store and I would watch her show at home and see her impressive collection of kitchen tools (all sold at Williams-Sonoma, of course). She made me want to be a great cook and hostess. Her books are all full of huge, full color photos and detailed instructions. She also includes interesting stories about the creation of the recipes and fun entertaining ideas. I enjoy the casual and relaxed mood of her cooking shows and how she uses a few good ingredients to create very impressive meals. I've loved almost everything I've chosen to cook from her books. My favorite recipes (so far) from Back to Basics are Baked Shrimp Scampi and Homemade Granola Bars. There are so many other recipes that I can't wait to try and I'm sure I'll be blogging about them soon.